Chartreuseweg 20, 8200 Bruges, Belgium. 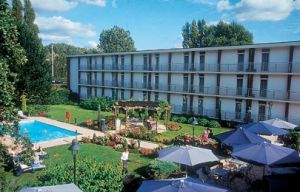 Leonardo Hotel Brugge, in the midst of woodland surroundings, is the dream setting for peaceful family holidays and a relaxing break for travelling business professionals. Situated only 4 km from the town centre and 1 km from the E40 motorway (exit nr 7) and on the A17/E403 Paris-Lille-Zeebrugge. Large terrace with open air swimming pool, playground and ping-pong table. During July and August daily animation for children between 17.30H and 20.30H. Internet services and WiFi are available (extra charge).There are internetcomputers available in the lobby (extra charge). Forest, Centre, Near highway, Near the historic centre. Children less than 13 year(s) old: free of charge. Children's Playground, Table Tennis, Hiking, Cycling, Outdoor Swimming Pool. 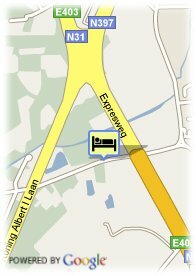 The Apollo Arthotel is situated at approximately 2 km from the Main Square of Bruges in a quiet park.